Since the first tourists were guided to Maligne Lake by Fred Brewster in 1914, the journey has evolved greatly. Instead of a three-day horseback trip, it’s now a one-hour drive from downtown Jasper along a paved road, and the handmade wooden boats used a century ago have been replaced by comfortable motorboats that zip up and down the lake. 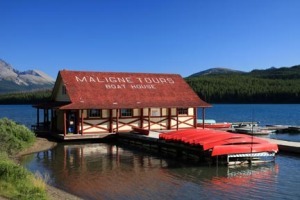 Although a fur trading post had been established as early as 1813 in the nearby Athabasca River Valley and Hudson’s Bay Company employee Michel Klyne likely visited the lake as early as 1824 on seasonal trading trips to the Kootenay Plains, the first official recording of Maligne Lake was made in 1875 by Henry McLeod (sometimes spelled MacLeod), a railway surveyor. At the time, it had been over six decades since David Thompson had made his historic crossing of Athabasca Pass; the fur trading post in the Athabasca River Valley had been abandoned and the only residents of what is now Jasper National Park were a few pioneering families. McLeod was one of 800 men working for Sir Sandford Fleming, assigned by the government to provide the Canadian Pacific Railway (CPR) with reference material as it set out to choose a route for the transcontinental railway. As part of his survey work, McLeod followed the Maligne River to its source but found travelling up the Maligne Valley very difficult—when he reached the lake at the head of the valley, he dubbed it “Sore Foot,” for his difficult journey. Not wanting to traverse the valley a second time, McLeod headed east and followed the Rocky River back to the Athabasca River Valley. Not surprisingly, upon returning to Edmonton, McLeod reported to Fleming that the Maligne Valley was not a practical route for the transcontinental railway. For 30 years after McLeod’s visit, the lake remained a mythical place. Word of its beauty had spread, but it remained remote and difficult to reach. Although the railway was yet to reach Jasper Forest Park, which had been established in 1907, the CPR had been laid across the Canadian Rockies to the south; the settlements of Banff, Lake Louise, Field, and Rogers Pass became popular bases for adventurous travellers, who would hire local guides and head into the wilderness for days or even weeks at a time. One such adventurer was Mary Schäffer, who, like many of her male contemporaries, dedicated her summers to exploring remote regions in the Canadian Rockies. It may be surprising to learn that a woman in the 1900s had been allowed to explore the Canadian wilderness amidst the crude company of packers and guides, and there were likely people who frowned at Schäffer’s behaviour. But she did not see how enjoying nature could possibly be equated with indecency, and as a result, she helped to usher in a new era of feminine freedom in a post-Victorian world. Born Mary Townsend Sharples on October 4, 1861, she grew up in a wealthy, educated, and highly affluent Quaker family from Philadelphia. From a young age, she was encouraged to cultivate her skills in photography and painting. In 1887, 26-year-old Sharples first travelled to the Canadian Rockies along the newly laid CPR with Dr. Charles Schäffer, a friend of Sharples’s father, as her chaperone. Although Dr. Schäffer was 23 years older than Sharples, they found kindred spirits in each other, especially when it came to their shared love of natural history. Sharples and Dr. Schäffer were married two years later, in 1889. The couple spent most of their summers together exploring the Canadian Rockies until Dr. Schäffer passed away unexpectedly in 1903. After her husband’s death, Schäffer entered a new chapter in her life. In honour of her deceased husband, she returned to the Canadian Rockies in 1904. Banff outfitter Tom Wilson recommended Billy Warren, one of his guides, to lead her through the Canadian wilderness. Over the next few summers, she used her husband’s botanical studies to write Alpine Flora of the Canadian Rockies, which was published in 1907. After reading Climbs and Explorations in the Canadian Rockies (1903), by Hugh Stutfield and John Norman Collie, Schäffer became interested in exploring what lay north of the Columbia Icefield. She was particularly keen to visit Brazeau Lake and search for a lake further north known to the Stoney of the Kootenay Plains as “Chaba Imne” (Beaver Lake). Returning from a 1907 journey to Brazeau Lake, guides Billy Warren and Sid Unwin led her party to the Kootenay Plains, where their boss, Tom Wilson, had a cabin. At the plains, they were invited to dinner with Wilson’s neighbour and fellow outfitter Elliot Barnes. Samson and Leah Beaver and their daughter Frances Louis were also at the dinner. Much of the discussion that night revolved around the North Saskatchewan River Valley, the area from which Schäffer and her party had just returned. When Schäffer spoke of her fascination with the stories she had heard of Chaba Imne, Samson surprised her by saying that not only did he know of the lake but he had visited it as a child with his father. Luckily for Schäffer, Samson remembered the way to the lake and drew her a map. The evening would prove to be momentous for both Schäffer and the history of the Canadian Rockies. In 1911, by the time Schäffer had published Old Indian Trails of the Canadian Rockies, which included a detailed account of her 1908 expedition to Maligne Lake, her fame had spread. At the time, both the government and the Grand Trunk Pacific Railway (GTP) were eager to see Maligne Lake mapped and surveyed so that it could be open to the expected crowds of tourists that would begin arriving by train. Upon the urging of Donaldson B. Dowling of the Geological Survey of Canada (GSC), Schäffer returned to Maligne Lake in 1911. On this occasion, sponsored by the GTP, she did not travel via the old hunting trails from the south as she had done in 1908 but instead rode the train west from Edmonton to Hinton, or as she described, along the “iron python—an intrusive creature born of an industrial age penetrating deep into once sacred places . . . ” Accompanying Schäffer was her sister in-law Caroline Sharples and Caroline’s 10-year-old son, Paul. From Hinton, Otto guided the Schäffer party west along the Athabasca River passed the distinct peak of Roche Miette and the mining town of Pocahontas before setting up camp at the site of Jasper House, an abandoned fur trading post. The next day they visited with Lewis and Suzette Swift, the lone homesteaders in the valley. Rather than using the Maligne Valley to access Maligne Lake, the government requested that Schäffer survey a trail that had been cut running south from the railway to Buffalo Prairie and then east along Wabasso Creek and up and over the Maligne Range to the north of Curator Mountain. Although snow still covered the trail at higher elevations, Otto guided them to the north shore of Maligne Lake, which they reached on June 19, 1911. Making the journey more difficult was the problem of transporting a rather heavy and cumbersome wooden boat up to the lake. Otto rose to the challenge; he disassembled the boat and tied the planks to the side of his horse. The long planks made it impossible for the horse to navigate its own path, so Jack guided it and used the planks like a rudder to steer. Maligne Lake was to be Schäffer’s home for the next six weeks. And while her cheery description of their camp suggests an easy and idyllic vacation, there was work to be done. Using a compass, Schäffer began surveying the lake. She later wrote, “It did not take more than two days’ work for me to realize it was no child’s play, or the work a matter of a few days.” Mary and her crew worked from north to south, taking measurements to create a survey that was used to create the first official government map of Maligne Lake. As part of her submission to the government, Schäffer suggested names for many of the surrounding geological features, including mounts Warren and Unwin for her guides and Samson and Leah peaks for her Stoney friends. For the peak beside Unwin, Schäffer proposed Mount Charlton, for Harry Ready Charlton, GTP publicity agent who had sponsored her expedition. As was the toponymic standard, Schäffer chose to name Maligne Lake for the river it fed. All names were approved by November 1911. Before Harkin was appointed, and even before the first passenger trains began rolling into the divisional point of Fitzhugh (now the town of Jasper), a number of guides and outfitters had established businesses in the park in anticipation of a tourism boom. The Moberly brothers, born in the Athabasca River Valley, were joined by the Brewsters, the Ottos, the Hargreaves, and Curly Phillips—all of whom played an important role in Jasper’s development as a tourist destination. They combined a love of adventure with a flair for business, sensing the park’s potential as an opportunity to do business with those who were looking for adventure in the Canadian Rockies. One of Jasper’s best-known outfitters was Frederick Archibald Brewster, who was born in Kildonan, Manitoba, in 1884. His parents, John and Isabella Brewster, moved west from Manitoba in 1888 and established a dairy to provide milk for the Banff Springs Hotel. After earning an engineering degree from Queen’s University in Ontario, Fred and his younger brother, Jack, arrived in the Athabasca River Valley in the spring of 1911. After spending a year working for the GTP, which was being constructed through the valley, the two brothers had enough money to start their own guiding business. Along with their brother-in-law, Phil Moore, Fred and Jack established Brewster and Moore’s in 1912. Fred was a voracious reader of early literature regarding the Canadian Rockies, which made him a favourite with scientific expeditions looking for knowledgeable locals; he also guided big game hunters and wealthy tourists who arrived on the newly completed railway. During this time, he visited Maligne Lake a number of times and travelled along a rough trail running up the Rocky River and through the Colin Range via Jacques Lake. Before the onset of World War I, Fred Brewster and a crew of local men were contracted by the government to clear a wagon road up the Maligne Valley as far as Medicine Lake. It ran along the base of Old Fort Point, past Tent City (now Jasper Park Lodge), and between Lakes Edith and Annette before switchbacking up to the top of Maligne Canyon. Brewster subsequently established tent camps at the south end of Medicine Lake and the north end of Maligne Lake. Guests travelled by horseback from the Athabasca River Valley up the Maligne Valley on the wagon road and then along Medicine Lake to a junction with an old trail that led down from Jacques Lake. Arriving at the south end of Medicine Lake, tourists were accommodated in primitive tent cabins, which comprised a planked floor and log walls covered with canvas. Two tents were set up for sleeping and a third for dining. From Medicine Lake, it was a full day’s horseback ride to Maligne Lake, where a similar cluster of tent cabins overlooked the north end of lake. The first guests—Josephine Rathbone, a well-travelled librarian from New York, and a young man from the Curtis Publishing Company and his wife—arrived at Brewster’s Maligne Lake camp in 1914. At this time, the camp hosted a maximum of four guests at any one time, plus two camp attendants. The raft left behind by Schäffer in 1911 was used to take guests out onto the lake. In 1915, Brewster volunteered for military service in World War I. Commissioned as a major, he served with distinction with the 2nd Tunnelling Company of the Canadian Engineers in England and France. He was awarded the Military Cross on January 1, 1917, and returned to Jasper in 1919. Another of the earliest guiding and outfitting businesses based in Jasper Forest Park was operated by Donald Nelson “Curly” Phillips, nicknamed for his curly locks. He was born on April 15, 1884, in Dorset, Ontario. Curly’s father, Daniel Alvin Phillips, was responsible for giving Curly an early start at outdoor education. By the age of 12, Curly was already managing his own trapline. He was also a master craftsman of boats, a skill he had learned under his father’s guidance. It was a combination of these skills and his confidence that made Curly one of the park’s most sought-after guides. Curly arrived in the Athabasca River Valley in 1909, at the beginning of a new age of exploration. The timing was perfect on his part—the first thing an explorer required was a competent guide and someone to outfit him or her for the wilderness. Curly gained a reputation for being reliable, remaining calm in all types of unpredictable situations, and protecting his clients from wild animals. He also mastered the use of an axe—a prized quality in a road-less park with few trails. His skill was exceptional when it came to building canoes, cabins, and temporary bridges across rivers. Curly was also endorsed by the Alpine Club of Canada as one of its official outfitters, which was a huge boast for business. In the summer of 1911, Curly outfitted a joint Alpine Club of Canada–Smithsonian Institution expedition to the Mount Robson region that included such luminaries as Austrian mountaineer Conrad Kain; surveyor Arthur O. Wheeler; George Kinney, who is best known for his Mount Robson summit attempts; and palaeontologist Dr. Charles Walcott, who is credited with discovering the Burgess Shale in Yoho National Park. After returning from Robson, Curly and James Shand–Harvey, an Eton-educated guide who settled in the park around the same time as Curly, led the party to Maligne Lake along the same trail from Buffalo Prairie used by Schäffer earlier that year. Accompanying the party was artist Alexander Phimister Proctor and photographer, Byron Harmon, of Banff. Using a large format camera, Harmon’s negatives from this 1911 trip produce black and white prints of exceptional quality. At the conclusion of the 1924 summer guiding season, Curly married Grace Inkster, whom he had met at a skating party in Edmonton. Inkster was a member of a pioneering family who had homesteaded the King Edward Park area, southeast of downtown, as early as the 1870s. The couple had three children: Sam (born in 1928), Joy (1930), and Ivy (1932). Even after World War I, the wagon road up the Maligne Valley was very rough and ended well before Maligne Lake, but it did open up the valley to more visitors. These visitors included Lawren Harris and A. Y. Jackman, in 1924. Two of Canada’s well-known Group of Seven painters, they were contracted by the Canadian National Railway (CNR) to produce paintings of the park. With wardens transporting their ample art supplies up the Maligne Valley, the two artists established a lakeside base camp and then travelled the length of the lake by boat and hiked into the surrounding hills in search of artistic panoramas. During this trip, Harris painted Maligne Lake in his recognizable simple, decorative style; he used cold shades of blue and turquoise to illustrate the solitude of the wilderness. This historic piece of art is now owned by the National Gallery of Canada. The following year, in 1925, the Trail Riders of the Canadian Rockies—supported by luminaries such as Mary Schäffer, Commissioner of Dominion Parks J.B. Harkin, artist Carl Rungius, and Fred Brewster’s older brothers Jim and Bill—had its annual powwow at Maligne Lake. In addition to guiding, Fred and Jack Brewster were involved in the original Jasper Park Lodge, which is regarded today as one of the world’s premier mountain resorts. Before World War I, the lodging comprised canvas tents spread along the shore of Lac Beauvert (then known as Horseshoe Lake), across the Athabasca River from the railway, and was known as Tent City. In 1921, the brothers sold Tent City to the CNR, which was anxious to establish a flagship resort that could compete with CPR resorts like the Banff Springs. Despite selling Tent City, the Brewsters retained exclusive rights to operate trail rides. Brewster trail rides and overnight trips up the Maligne Valley to the two camps were often featured in railway advertising and other publications. As a result, Fred Brewster’s Rocky Mountain Camps became extremely popular. Meanwhile, Jack had begun offering three-week pack trips along the Glacier Trail, which ran from Jasper to Lake Louise via Maligne Lake and Maligne Pass. In 1927, Fred Brewster replaced his tent cabins at Maligne Lake with a log chalet, and the following year, a log chalet was added to his Medicine Lake camp. By the mid-1920s, the golden era of guiding was coming to an end in the Canadian Rockies, so Curly Phillips sought employment as Brewster’s Maligne Lake camp manager. In addition to his duties around the chalet, Curly spent his time building a boat. He had built his first boat for Brewster in 1920, but this one was larger and would be the first with a motor to be used on Maligne Lake. Six metres (20-feet) long and seating 24 passengers, it could easily reach Samson Narrows (Spirit Island) in a few hours, something that had not been possible in the past. The scenic cruises proved so popular that Curly applied for his own tour boat concession. After being granted permission, he set to work building a boathouse along the same stretch of lakeshore as the Brewster dock. It was supported by log pilings driven into the shallow water at the lakeshore with planked decking. The actual building was of post-and-beam construction; it was 12 metres (40 feet) wide and 15 metres (50 feet) long and topped by a shingle roof. Completed in 1929, the structure was entirely in keeping with the government’s architectural guidelines and remains an iconic building to this day. The boathouse at Maligne Lake dates to 1929. Soon after opening the boathouse, Curly built the cedar-planked Leah, which was named for the wife of Samson Beaver, who had drawn the map that helped Schäffer find the lake two decades previously. The boat remained in service until the 1970s. Twelve passengers could be seated on the wooden bench that ran down the centre of the boat; blankets were offered on cooler days. At the same time Curly was building his boathouse, the government began stocking Maligne Lake with trout. This attracted anglers—a new breed of visitors who were anxious to rent boats. They rented boats from Curly for $0.50 for the first hour and $0.25 for each hour after or at a flat rate of $2.00 per day. By this time, Curly had erected simple tent cabins near his boathouse, which offered accommodation and food for up to 25 guests at one time at what he advertised as Rainbow Camp. His brother (Harry), his father (Alvin), his brother-in-law (Bert Wilkins), as well as Jasper locals such as Adam Joachim, who was a descendant of one of the region’s first fur traders, helped him run his camp. The earliest promotional brochures for Curly’s Rainbow Camp boasted of fishing, boating, summer skiing, and mountain climbing. When Brewster first established his camp at Maligne Lake in 1914, visitors travelled by horseback all the way from the Athabasca River Valley to Maligne Lake. After World War I, when the wagon road was widened to accommodate automobile traffic, the journey was shortened considerably. From the end of the road at the north end of Medicine Lake, Brewster and Curly Phillips began transporting their guests by boat to the south end of Medicine Lake, where they would spend the night. The following morning, they saddled up for a trail ride between Medicine and Maligne lakes. Although it still took two days to reach Maligne Lake, the trip was a popular adventure with tourists from around the world; Brewster offered the option of returning to the Athabasca River Valley and Jasper townsite via Shovel Pass and Buffalo Prairie (the route taken by Schäffer in 1911). This “circle trip” had been pioneered by Brewster as early as 1914. Horses were an integral part of transporting both supplies and tourists to Maligne Lake. At the beginning of each summer season, Brewster and Phillips would hire wranglers to look after their precious horses. The hired hands were also expected to cook, help maintain the camp buildings, and take tourists on extended trail rides. Nick Bleskie was typical of the cowboys hired by Brewster. Born in Manitoba in 1896, Bleskie headed west at just 11 years old. By the mid-1930s, he found himself working for Brewster at Maligne Lake; he worked as a guide and boatman and tended horses. Bleskie became renowned in Jasper for his rapport with horses, especially with a horse named Bluebell, who used to give him kisses. The popularity of skiing in the Maligne Valley brought about the formation of the Maligne Lake Ski Club in the 1930s. In 1936, four of its most active members—the Jeffery brothers, Curly Phillips, and Swiss-born Joe Weiss—built a log cabin high above Maligne Lake near Shovel Pass at a location that became known as Snowbowl, for its abundant snow. The Maligne Lake Ski Club began offering guided ski trips to their cabin, which was known as “Shangri-La.” The adventure cost $30 and included a week of lodging, meals, and transportation from town to Medicine Lake. Word quickly spread throughout Jasper that there had been an avalanche and that Curly and one of the Pugh boys were missing. The town immediately banded together; search parties were sent out and other people stayed behind to comfort Curly’s wife and family. The search lasted a week before Reginald’s body was recovered, and another week went by before Curly’s body was found. Famed mountaineer J. Monroe Thorington wrote the following tribute, which was published in the American Alpine Journal: “Curly is remembered as a man of quiet reserve always ready to laugh, as one who moved like a shadow in the woods, and carved his own brand of woodsmanship out of old Indian ways and his own integrity as a person who relied on himself. These are the qualities for which the man and his times should be remembered for these are the strengths modern people need most.” Mount Phillips, on the Continental Divide between Jasper National Park and Mount Robson Provincial Park, is named in his honour. At the onset of World War II, the government employed conscientious objectors (Canadian men who refused military service, mostly due to religion) to work on numerous road projects in Jasper National Park. Completion of the Jasper–Banff Highway (Icefields Parkway) was their main task, but the men also upgraded the road between Maligne Canyon and Medicine Lake, built the road out to Sixth Bridge on the lower Maligne River, and constructed a rough fire road between Medicine and Maligne lakes. Even after the road up the Maligne Valley had been upgraded, the section between Maligne Canyon and the end of the road at Medicine Lake was a narrow track designated as one-way. Vehicles heading towards Medicine Lake were allowed to enter during even hours; those travelling back to town were only permitted on the road during odd hours. There was a gatekeeper posted at Maligne Canyon to monitor the traffic. While there was a slight drop in the number of visitors travelling to Jasper during World War II, Brewster’s Maligne Lake Chalet remained a popular spot for tourists; in 1940, Brewster wrote that he hosted a record 131 guests. He also remarked that an increase in guests had made it difficult for his packers to keep up with the amount of supplies needed. In order to make the transportation of supplies easier, Brewster employed a crew of men to widen the trail between Medicine and Maligne lakes; although the original horse trail was more like a road after his men worked on it, it was still barely wide enough to accommodate a vehicle. Brewster then rafted a fleet of old Packard touring cars across Medicine Lake and began using them to transport guests and supplies between Medicine and Maligne lakes. With the vehicles in place, travel time between the Jasper townsite and Maligne Lake was reduced to eight hours. Travel time was reduced even further as Brewster made improvements to the road over the next decade. After Curly’s untimely death in 1938, his wife, Grace, took over Rainbow Camp. Larry and Hilda Magistad were employed as managers; the couple ran the tent camp, rented canoes and rowboats, and operated boat tours out of Curly’s boathouse aboard the Leah. For eight years, Grace remained involved with Curly’s business while raising their three children by herself. In 1946, she sold Rainbow Camp to Jack and Colin McIsaac, Roy Olberg, Lyle Johnson, and Harry Alexander. Although Grace eventually moved back to Edmonton, Curly and Grace’s son, Sam, continued to work at the lake as a fishing guide. The new owners renamed the business “Rainbow Tours” and opened a ticket office in downtown Jasper at Joe Weiss’s Tekarra Gift Shop at 607 Patricia Street. In 1947, Rainbow Tours began using specially designed seven-passenger Dodge vehicles to transport their guests between Medicine and Maligne lakes. The following year, they constructed Rainbow Lodge. Located on the site of today’s Maligne Tours day lodge, it was similar in function to Brewster’s adjacent Maligne Lake Chalet—designed as a place for day-trippers and overnight guests to dine and relax. In 1948, the heated Rainbow Tours tent cabins, which were advertised as having “spring beds,” rented for $8.00 per person per day, inclusive of transportation from Jasper and all meals. It cost $15.00 to rent a powered canoe for a full day and $3.50 for a rowboat. It was possible to make a day trip to Maligne Lake from the Jasper Park Lodge or the Jasper townsite, but it was a long day, as the tour departed at 8:00 a.m. and did not return until 8:00 p.m. that evening. After the summer season of 1952, Rainbow Tours was purchased by Neil Campbell, an Edmonton businessman, who changed the name of the company to the more appropriate “Maligne Tours.” In 1955, after just three years, Campbell sold Maligne Tours to Bill Ruddy, who had pioneered snowcat tours on the Columbia Icefield. Bill and his wife Evelyn were renowned for their hands-on approach to ensuring that visitors to Maligne Lake enjoyed themselves, and they were equally popular with their staff members, many of whom returned year after year. They built wooden guest cabins beside the existing tent cabins and constructed a new washroom building (now the Maligne Tours ticket office). Ruddy was known for his distinctive outfit—green woollen pants and shirt and a Bavarian-style green alpine hat with a feather. (Staff liked to recite, “The man in the green who runs the scene at Maligne.”) In 1959, Ruddy built a ticket office in downtown Jasper at 414 Connaught Drive. Known today as the Maligne Building, it was constructed with distinctive pink-tinged rock from the Jonas Slide, an ancient rock slide crossed by the Icefields Parkway around 90 kilometres (56 miles) south of town. Also changing hands during this era was the iconic Brewster’s Rocky Mountain Camps, which was purchased by Tom and Yvette Vinson in 1955. Tom Vinson had worked as a wrangler for Brewster since arriving in Jasper in 1939 and had met his future wife while she was working at the Jasper Park Lodge. The Vinsons’ main interests were trail riding and backcountry pack trips, so when they purchased the company Brewster had owned and operated for over four decades, the Maligne Lake camp was excluded from the sale. Seven years later, Brewster sold the Maligne Lake camp to Calgarian Ken Lucas, who owned it for seven years before selling to Bill Ruddy. With the completion of the Yellowhead Highway imminent, joining Maligne Lake by road to the outside world became a priority in the 1960s. By 1965, a rough road had been built all the way to Maligne Lake, but it was only open to the public as far as the south end of Medicine Lake, from where buses shuttled visitors by bus to Maligne Lake. With a road completed, boat service across Medicine Lake was discontinued and Brewster’s original Medicine Lake Chalet, built where the Maligne River flows into Medicine Lake, was dismantled log by log and moved to the Vinson’s Rocky Mountain Ranch, east of Jasper National Park. It was not only tourists visiting the lake; Jasper locals would leave their boats at the lake all summer and would ride the bus to get to the boats, which were mostly used for fishing. In 1967, as the road beyond Medicine Lake was further improved, the public parking area was moved further south. Finally, in 1969, the public road was completed all the way to Maligne Lake and then paved the following summer. Another major change that took place at Maligne Lake in the 1960s was the closure of tourist accommodations, as had been mandated in a 1963 government report (although tent cabins remained at the lake as staff accommodations until 1985). On March 4, 1969, Fred Brewster, who had come to be known as “Mr. Jasper,” passed away in an Edmonton hospital, aged 85. He had officially retired many years earlier, after selling his business to Vinson in 1955. Up until his death, he remained very active in the Jasper community. He was a founding member of the Jasper–Yellowhead Historical Society and was honoured as a life member of the Jasper Ski Club, the Jasper Chamber of Commerce and the Jasper branch of the Canadian Legion. Major Fred Brewster is buried in the Jasper cemetery next to his wife, Azalea. In anticipation of a flood of visitors arriving in their own vehicles after Maligne Lake Road opened to the public, Ruddy purchased additional tour boats and, in 1977, constructed the present-day lodge on the site of the Rainbow Lodge. During this time, Ruddy converted the four-bedroom guesthouse Brewster had built in 1935 into a residence for himself, his wife, and their two daughters; his two sons bunked in the upper level of today’s ticket office. In 1980, after almost three decades at Maligne Lake, Ruddy sold Maligne Tours to Gerry Levasseur. Unlike today, there were few restrictions on visitors to Maligne Lake up until the 1970s, even after the road had been completed and tourists were arriving by the thousands by automobile. In an effort to protect the lake from fuel spills and noisy boats, gasoline-powered boats were banned in the 1970s; only battery-charged electric motors were permitted and the ban still holds to this day (Maligne Tours is granted an exemption and is allowed to power its tour boats with Volvo Penta engines driving twin propellers). Additionally, travel by all motorboats was restricted to the northern half of the lake. In the 1970s, there was interest in building a large marina and two lakeside motels; it was even proposed that a road should be built across Maligne Pass to create a direct route between Maligne Lake and the Icefields Parkway. Although none of these grandiose plans came to fruition, an impressive bridge was built across the outlet of Maligne Lake in preparation for the road over Maligne Pass that never eventuated. As the number of visitors to Maligne Lake continued to increase into the 1980s, so did the number of activities and services. In 1986, commercial whitewater rafting on the Maligne River received approval from Parks Canada. Three years later, in 1989, commercial horseback riding commenced; the most popular trip led above the treeline and into the Bald Hills. In the mid-1990s, biologists began reporting declines in the population of harlequin ducks on the Maligne River. Although the direct link was not made to increased tourism, the government banned whitewater rafting trips on the Maligne River in 1998. Through all the advances in modern technology, there is still no phone line linking Maligne Lake to the outside world; instead there’s a satellite phone and Internet link. As early as the 1940s, a lack of reliable communications to the lake led to the establishment of downtown ticket offices. They have been in a number of locations, including Tekarra Gift Shop, Jasper Camera & Gift, the Maligne Building on Connaught Drive, and in the lobby of the Jasper Park Lodge. The current Maligne Tours ticket office, on Patricia Street, opened in 2006. Today, commercial operations at Maligne Lake—the scenic cruises, boathouse, day lodge, and shuttle bus from town—are operated by Maligne Tours. Although boat tours don’t start until the ice is off the lake, Maligne Tours staff begin preparing for the season in mid-April. This company employs up to 75 people in peak season, many of which have worked out at the lake for decades. General manager Pat Crowley has worked for Maligne Tours for almost 40 years. Although the main focus at Maligne Lake is on nature, a variety of connections to the past can be experienced. Maligne Lake Chalet, listed on the Register of the Government of Canada Heritage Buildings, has been extensively restored; canoes can be rented from Curly Phillips’s boathouse, which is on the Alberta Register of Historic Places; and hikers can explore trails laid out by explorers and pioneers. Carrying on in the tradition of those linked to tourism, both Parks Canada and Maligne Tours have made great strides to ensure that the lake’s history and the pristine wilderness that surrounds it are preserved for future generations of visitors. This Maligne Lake history was written by Meghan Power, a local historian who is the author Maligne Lake: The Jewel of Jasper National Park. This book is sold at the Maligne Lake day lodge, as well as at other Jasper bookstores and online by Summerthought Publishing.